Dumpling Making, Paint Brushing, Pottery Making, Biking, Rafting, Kite Flying! A great China Culture Tour that brings you to the top destinations at a leisurely pace with a good balance of fun things to do for the entire family and free time for enjoying markets, food stalls, the countryside or whatever you might run into in your travels. Kids will enjoy bike rides while grandma and grandpa will chase them in the golf carts... want to learn how pottery is made? or try your hand at some brush painting? go rafting, hiking or caving? we've got you covered! We asked our friend Morgen from www.chinaculturetour.com to put this sample itinerary together with a list of places and activities based on what we have enjoyed the most with our family, he suggested a couple more things that would be fun with the kids, and tailored this 13-day 12-night Tour to Beijing, Xian, Guilin and Shanghai. China Culture Tour is a Guilin-based agent, their tours will not only take you to the must see's of China, but give you a great insight into the culture and life of the country. The itinerary can be adapted further to fit your needs to easily add whatever interests you and to your preferred level of comfort. Here are some tour prices for three different categories: standard, boutique, luxury. The tour is privately arranged for you and your family, there are no set departure dates, you choose when to go. Use them as guidelines as prices vary according to season and exchange rate fluctuations. You can contact Morgen with any inquiries and questions you might have, he can help you plan the trip of a lifetime! Here are the Day-by-Day Tour details, remember you can add and subtract activities, destinations, extra days, etc. Arrive in Beijing, you will be met at the airport and escorted to your hotel. 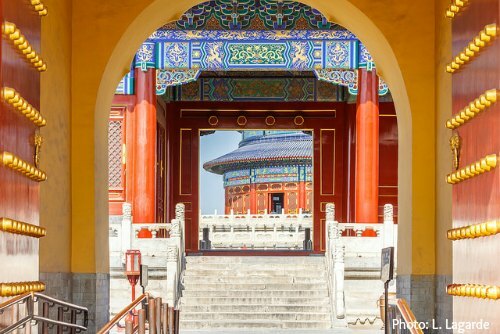 We start our tour to China in Beijing, the nation's capital and home to China's most famous historical sites. Here we will visit the Forbidden City and Tiananmen Square. Later, we go to the Beijing Hutongs or narrow traditional alleyways where we will zip around in our rickshaws, and stop by and visit a family that will teach us how to make dumplings! We end the day with an exciting Kung Fu show. If traveling with kids and specially in the summer months, we suggest to keep the visits to the Forbidden City and Tiannamen Square a bit short, these are impressive and massive structures with a lot of history to match, the tour guides are very knowledgeable and passionate about all the history, but this doesn't sit too well with small children when standing in the hot sun! If you see the kids getting impatient, it's time to keep things moving, ask your guide politely to move along, riding the rickshaws will be fun and entertaining for the children. Today we go to the Great Wall, we will drive to the Mutianyu section, which is roughly two hours away from Beijing. We will ride the cable car up, then slide the toboggan to come down. Grandma and grandpa can ride the cable car back. On the way back we stop at a Cloisonne Factory to see how it is made, and if time allows and we still have the energy, we stop at the Silk Market, one of our favorite places for haggling and shopping for knick knacks. Our last day in Beijing brings us to the Temple of Heaven, where we get to fly kites. We stop at the Olympic Green for a quick look, home of the Bird's Nest and the Water Cube, where the Beijing Olympics took place. In the afternoon we fly to our next stop: Xian. We have some free time tonight to stroll around the Muslim Quarter, which is the liveliest spot with great food stalls and souvenirs. Xian is a modern metropolis and hard to believe it served as China's ancient capital for over 10 dynasties. Xian is of course well-known for its Army of Terracotta Warriors, which we will visit today. Also we stop at a pottery factory where we try making our own figurines! This morning we visit the Xian Ancient City Wall, the most complete City Wall that has survived China's long history. Here we get a chance to ride on a piece of history. Grandma and Grandpa can choose to ride the golf carts, also a very fun ride. In the afternoon, we fly to our next stop: Beautiful Guilin. Guilin is famous for its stunning landscape and karst mountain formations. Today we explore the surroundings and do a little light trekking: Folded Brocade Hill and its carvings, Reed Flute Cave and Elephant Trunk Hill. Today we cruise down the Li River to Yangshuo, through what has to be one of China's most spectacular scenery. The mountains flanking the river, the countryside scenes with fishermen and farmers going on their daily routines, a beautiful 4 hour cruise will bring us to our next stop, the small village of Yangshuo. We explore West Street in Yangshuo, a very lively pedestrian-only street lined with small shops, restaurants, cafes and trinket stalls. And tonight we enjoy the one-of-a-kind Impression Sanjie Liu Show, a fantastic production by director Zhang Yimou, the famoous Chinese film-maker that brought us the dazzling Beijing Olympics Opening and Closing Ceremonies. The stage is nothing less than the river with the beautiful mountains as backdrop and over 600 local performers taking part in this amazing production. Today we enjoy a great outing in the countryside, we will bike through rice paddies, farm fields and karst mountains, then raft along the Yulong river, one of the small tributaries of the Li River. These mountains have been the inspiration to many artists and painters, and after a day in this beautiful environment, you will be inspired too! Here we give you the chance to try out your brush painting skills! Today we drive back to Guilin and fly to our last stop on our tour: Shanghai. In Shanghai we have some free time to explore the Bund, the heart of Colonial Shanghai, and Nanjing Road right in the middle of it all. Today we explore another two opposite facets of Shanghai: the Ancient Old Town section and the new Futuristic District of Pudong. In the Old Town, we take a look at the Yuyuan Gardens and Bazaar. The gardens are in the traditional Chinese style and the bazaar next door is full of shops and stalls with everything from dumplings and food to trinkets and souvenirs. In contrast not far from Classical Shanghai we visit the Shanghai Urban Planning Exhibition Hall, a tribute to Modern Shanghai. I know it sounds boring, but it's anything but, it's a really cool scale model of the city with its tall skyscrapers which is where we are headed next. We cross over to futuristic Pudong and climb to the top of the Shanghai World Financial Center, China's tallest building, for a bird's eye view of the city. This evening we take in the beautiful skyline from the water on our Huangpu River Cruise. Today you can opt to experience real life with a Shanghai local or if you prefer a visit to Zhujiajiao, a nearby traditional water village. Your day with a Shanghainese local will take you to the market for the daily shopping, then they take you into their homes where you can appreciate how a local family lives, how they work, how they spend their spare time and how elders with grandchildren live together. You can practice some Shanghainese and enjoy a meal with your hosts. This is a very unique experience which older children would best benefit from. Another option for your last day in Shanghai is a visit to a traditional water village in the outskirts of the city with its traditional houses along the canals, the bridges and beautiful architecture. You can take a little Chinese style gondola at this "Venice of China"
And tonight, a great farewell will be the ERA Intersections of Time, a one-of-a-kind Acrobatics Show. 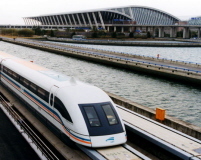 Our China tour ends today, the Shanghai Maglev will whisk us to the airport, this is the fastest train in the world in commercial operation, even faster than a Formula 1 race car! You can use the above tour to start tailoring your own adventure, it just gives you an idea of things to enjoy with the family during your trip to China. You can combine different destinations as well, perhaps replace a stay in Hong Kong instead of Shanghai, or add a few more days with a visit to Chengdu to see the Giant Pandas. Days can be added to the above destinations as well, whatever you plan, it can be easily arranged. Below find some rates for the above tour with accomodations in three different hotel categories. Rates are based on double occupancy. Tour includes all transfers, domestic flights and meals as specified above, private transportation for you and your group and a private guide at each of the different destinations. It does NOT include your airfare to get to China or the China Visa which you must obtain before you arrive in China. I'm not sure I would call this "standard", there is nothing "standard" about these arrangements! These hotels are certainly in our "affordable luxury" category, they are all major international brands, centrally located with excellent ammenities. Boutique hotels are smaller and in unique settings, and offer a more intimate atmosphere, the difference is in the personalized service and the details... iPod docks... Nespresso machines... mobile phones to take around town... a warning though, you might not ever want to leave the hotel! These are lavish establishments with off the chart service and ammenities. Opulent lobbies, award-winning restaurants, well-appointed suites, world-class gym and fitness centers are standard here. These properties have consistently attained the highest satisfaction ratings and are definitely worth a splurge!